Spend the 7th (Mon) among aquatic life with a scuba or snorkeling tour. 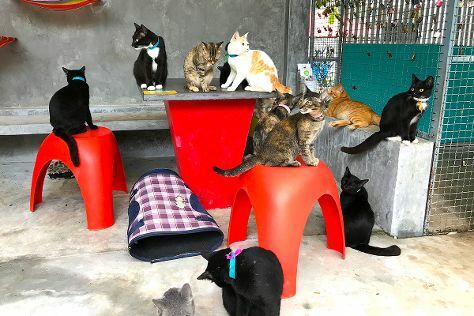 And it doesn't end there: identify plant and animal life at Lanta Animal Welfare, enjoy the sand and surf at Long Beach, tour the pleasant surroundings at Kantiang Bay, and look for gifts at Fashion Point. For reviews, other places to visit, maps, and more tourist information, read our Ko Lanta online attractions planner . Chicago, USA to Ko Lanta is an approximately 25-hour combination of flight, car, and ferry. You can also do a combination of flight, bus, and ferry; or do a combination of train, flight, car, and ferry. The time zone difference moving from Central Standard Time to Indochina Time is 13 hours. Expect much warmer temperatures when traveling from Chicago in January; daily highs in Ko Lanta reach 90°F and lows reach 72°F. Finish your sightseeing early on the 11th (Fri) to allow enough time to ride a ferry to Ko Phi Phi Don. Spend the 12th (Sat) among aquatic life with a scuba or snorkeling tour. The adventure continues: explore the activities along Maya Bay, don't miss a visit to Koh Phi Phi Viewpoint, tour the pleasant surroundings at Laem Tong Bay, and stop by Phi Phi Postcard Shop. To see ratings, photos, where to stay, and more tourist information, go to the Ko Phi Phi Don road trip planning website . Ride a ferry from Ko Lanta to Ko Phi Phi Don in an hour. In January, daily temperatures in Ko Phi Phi Don can reach 89°F, while at night they dip to 72°F. Wrap up your sightseeing on the 15th (Tue) to allow time to ride a ferry to Krabi Town. 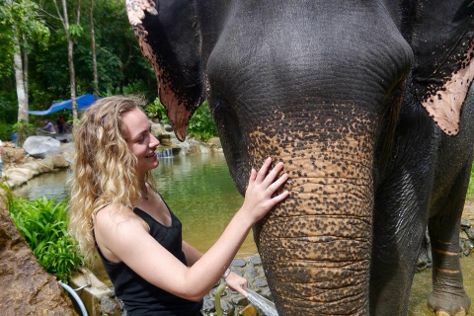 Step out of Krabi Town with an excursion to Phang Nga Elephant Park in Phang Nga--about 2 hours away. Next up on the itinerary: enjoy the sand and surf at Railay Beach, tour the pleasant surroundings at Ao Nang Beach, take some stellar pictures from Railay Beach Viewpoint, and take in the spiritual surroundings of Tiger Cave Temple (Wat Tham Suea). To find traveler tips, more things to do, and tourist information, you can read our Krabi Town planning site . You can ride a ferry from Ko Phi Phi Don to Krabi Town in 1.5 hours. Another option is to do a combination of ferry and bus. In January, plan for daily highs up to 89°F, and evening lows to 72°F. Cap off your sightseeing on the 21st (Mon) early enough to travel to Ko Pha Ngan. Spend the 23rd (Wed) among aquatic life with a scuba or snorkeling tour. The adventure continues: have fun at Kobra Muay Thai Boxing Stadium, kick back and relax at Haad Yuan Beach, and stroll through Thong Nai Pan Yai Beach. For maps, other places to visit, traveler tips, and other tourist information, read Ko Pha Ngan sightseeing tool . Getting from Krabi Town to Ko Pha Ngan by combination of bus and flight takes about 5 hours. Other options: do a combination of bus and taxi; or take a bus. Traveling from Krabi Town in January, plan for somewhat warmer nights in Ko Pha Ngan, with lows around 78°F. Finish up your sightseeing early on the 27th (Sun) so you can catch the ferry to Koh Tao. Spend the 28th (Mon) among aquatic life with a scuba or snorkeling tour. On the 1st (Fri), spend a cool day on the water with Unseen Tours Koh Tao. Next up on the itinerary: tour the pleasant surroundings at Sai Nuan Beach, enjoy the sand and surf at Rocky Bay, don't miss a visit to John-Suwan Viewpoint, and soothe aching muscles at some of the top local wellness centers. For other places to visit, where to stay, traveler tips, and other tourist information, read our Koh Tao day trip planning tool . You can ride a ferry from Ko Pha Ngan to Koh Tao in 2 hours. 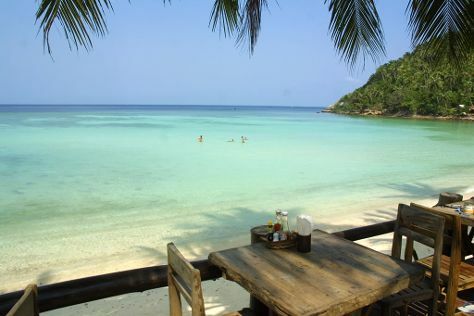 In January, daily temperatures in Koh Tao can reach 86°F, while at night they dip to 78°F. Finish your sightseeing early on the 1st (Fri) to allow enough time to travel to Patong. When in Patong, make a side trip to see Phuket Big Buddha in Chalong, approximately 46 minutes away. Spend the 3rd (Sun) among aquatic life with a scuba or snorkeling tour. There's much more to do: get outside with Patong Beach, don't miss a visit to Bangla Road, kick back and relax at Nai Thon Beach, and take in the dramatic scenery at Gibbon Rehabilitation Project. To see reviews, photos, more things to do, and tourist information, use the Patong trip tool . Do a combination of ferry and flight from Koh Tao to Patong in 4.5 hours. Alternatively, you can take a bus; or do a combination of ferry, taxi, and flight. Plan for little chillier nights when traveling from Koh Tao in February since evenings lows in Patong dip to 73°F. Finish your sightseeing early on the 6th (Wed) so you can travel to Similan Islands. 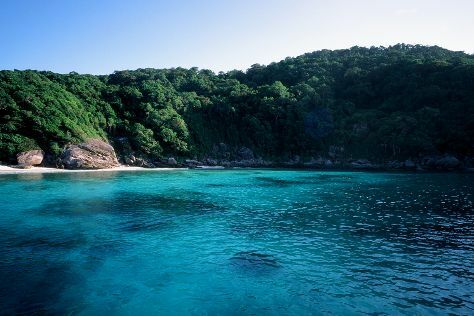 Start off your visit on the 7th (Thu): explore the striking landscape of Mu Ko Similan National Park. To find maps, photos, where to stay, and other tourist information, go to the Similan Islands itinerary tool . The Route module can help you plan travel from Patong to Similan Islands. In February in Similan Islands, expect temperatures between 91°F during the day and 73°F at night. Cap off your sightseeing on the 7th (Thu) early enough to travel to Khao Yai National Park. 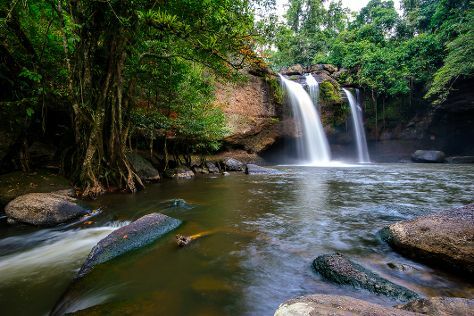 The oldest national park in Thailand--and a World Heritage Site to boot--Khao Yai National Park impresses visitors with its waterfalls, mountainous terrain, and abundant monsoon forest. Kick off your visit on the 8th (Fri): explore the wealth of natural beauty at Khao Yai National Park. Here are some ideas for day two: admire the sheer force of Haew Narok Waterfall and then get outside with Khao Yai Bird Watching Day Trip by Thailand Bird Watching. To find maps, ratings, other places to visit, and more tourist information, read our Khao Yai National Park visit planner . Explore your travel options from Similan Islands to Khao Yai National Park with the Route module. In February, daily temperatures in Khao Yai National Park can reach 94°F, while at night they dip to 73°F. Wrap up your sightseeing on the 9th (Sat) to allow time to drive to Pattaya. Change things up with these side-trips from Pattaya: Sriracha Tiger Zoo (in Chonburi), Ko Samae San (in Sattahip) and Khao Kheow Open Zoo (in Si Racha). There's still lots to do: don't miss a visit to Sanctuary of Truth (Prasat Sut Ja-Tum), meet the residents at Underwater World Pattaya, head off the coast to Koh Lan (Coral Island), and tour the pleasant surroundings at Pattaya Beach. 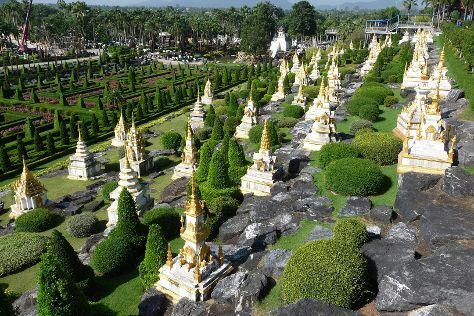 To find other places to visit, maps, more things to do, and tourist information, go to the Pattaya trip itinerary site . You can drive from Khao Yai National Park to Pattaya in 3.5 hours. Alternatively, you can do a combination of taxi, train, and bus; or do a combination of taxi and bus. Traveling from Khao Yai National Park in February, you will find days in Pattaya are slightly colder (87°F), and nights are about the same (74°F). Wrap up your sightseeing on the 15th (Fri) to allow time to drive to Bangkok. Bangkok is known for historic sites, shopping, nightlife, spas, and nature. Your plan includes some of its best attractions: explore the historical opulence of The Grand Palace, contemplate in the serene atmosphere at Wat Pho, look for all kinds of wild species at SEA LIFE Bangkok Ocean World, and relax and rejuvenate at some of the top local wellness centers. To find traveler tips, photos, reviews, and more tourist information, refer to the Bangkok travel planner. Getting from Pattaya to Bangkok by car takes about 2 hours. Other options: take a shuttle; or take a bus. In February in Bangkok, expect temperatures between 91°F during the day and 75°F at night. Wrap up your sightseeing on the 22nd (Fri) early enough to travel to Sukhothai. Kick off your visit on the 23rd (Sat): don't miss a visit to Wat Traphang Thong, admire the striking features of Wat Si Chum, then contemplate the long history of Sukhothai Historical Park, then contemplate in the serene atmosphere at Wat Maha That, and finally explore the ancient world of Wat Sa Si. On your second day here, explore the wealth of natural beauty at Si Satchanalai Historical Park. To find more things to do, traveler tips, ratings, and other tourist information, refer to the Sukhothai road trip planner . Getting from Bangkok to Sukhothai by combination of train and flight takes about 3.5 hours. Other options: do a combination of bus and flight; or drive. Traveling from Bangkok in February, Sukhothai is a bit cooler at night with lows of 68°F. Finish up your sightseeing early on the 24th (Sun) so you can go by car to Chiang Mai. You'll find plenty of places to visit near Chiang Mai: Thai Elephant Home (in Mae Taeng), Lampang (Thai Elephant Conservation Center & Wat Phra That Lampang Luang) and Doi Inthanon (in Doi Inthanon National Park). Spend the 25th (Mon) wandering through the wild on a nature and wildlife tour. On the 3rd (Sun), spend a fun day on foot with Walking tours. There's still lots to do: admire the landmark architecture of Wat Chedi Luang Worawihan, take in the spiritual surroundings of Wat Phra Singh, make a trip to Wat Ched Yot, and get lost in a book at Documentary Arts Asia. To see photos, reviews, where to stay, and more tourist information, you can read our Chiang Mai trip planner . You can drive from Sukhothai to Chiang Mai in 4.5 hours. Other options are to do a combination of taxi and train; or take a bus. Traveling from Sukhothai in February, Chiang Mai is little chillier at night with lows of 63°F. Finish up your sightseeing early on the 4th (Mon) so you can travel back home.